Curtis & Loretta’s music comes straight from the heart. 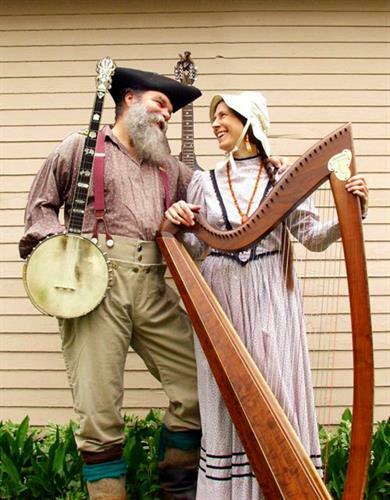 The husband and wife duo’s extraordinary harmonies and proficiency on a parade of stringed instruments create an alluring frame for their poignant original songs, and traditional pieces from America and the British Isles. The current menagerie includes mandocello, folk harp, guitars, clawhammer banjo, ukulele, and mandolin, plus a bit of kazoo, harmonica, and shakers. Curtis’ down-home sense of humor and Loretta’s theater background engage the audience in an experience that runs the gamut of rolling with laughter to holding back tears, with plenty of side-trips in between. They rack up countless miles each year, crisscrossing the country to deliver their own unique brand of folk singer/songwriter music. These artists often perform in costume.